Concrete is a popular paving and flooring option, both for homes and commercial spaces. It is durable, affordable, and highly versatile. However, it is not the most attractive material. In fact, it does not even dry in a uniform gray color. Unless you are one to embrace the industrial look of raw concrete, concrete stains and dyes can help enhance a plain gray surface into something more creative. But which one is the right option for you? Concrete dyes are often manufactured in concentrated forms. Although it is a non-reactive material, it becomes reactive when it is mixed with a carrier that will enable it to penetrate a concrete slab. The most common carriers are water and solvent. Concrete stains come in two types: acid and water-based. Acid stains contain metallic salts that induce a chemical reaction when it comes in contact with the natural lime and mineral content of concrete. Water-based stains do not cause any chemical reaction so it dries into a uniform color that is consistent all throughout. 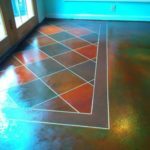 Concrete dyes can only be used on indoor floors. It is not resistant to UV rays and may fade or discolor under the sun. Concrete stains can be used in both indoor and outdoor settings. Because it penetrates deep into the concrete slab, the color will not wear out or fade. Depending on what type of carrier you use with a concrete dye, the color, when dry, may vary from translucent to opaque. It may also be marbled if desired. Concrete acid stain is often dry semi-translucent. The chemical reactions that take place create a mottled, stone-like look depending on the lime and mineral content of the slab. It comes in various earth colors. Water-based stains, on the other hand, dry opaque and the colors often dry in the same hue as it was prior to installation. It has a wider color selection, including metallics and pastels. It is highly recommended to research on how dyes and stains look like after being applied on concrete. If you have a look in mind, determine which one closely relates to the look you desire. Also, make sure to consider the costs, ease of installation, and the setting of the concrete surface you want to transform with color. 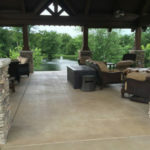 Consult a pro for more detailed and accurate information on dyed and stained concrete. Concrete is a popular material but it does not meet the aesthetic requirements of some home and commercial space owners. But this should not hold you back. 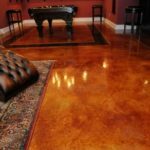 There are ways you can enhance concrete to make it look more appealing and unique. Dyed and stained concrete are two of the most popular coloring methods for concrete. Both materials are defined here based on the way they work, the most appropriate setting for application, and the aesthetic benefits that they could provide. Study each one until you feel comfortable about the decision you are about to make. If you need more help, consult a pro.